Source: PNAS Volume: 11 Pages: E2361 Publsihed: MAY 21 2014 . High harmonic generation driven by femtosecond lasers makes it possible to capture the fastest dynamics in molecules and materials. However, to date the shortest subfemtosecond (attosecond, 10−18 s) pulses have been produced only in the extreme UV region of the spectrum below 100 eV, which limits the range of materials and molecular systems that can be explored. Here we experimentally demonstrate a remarkable convergence of physics: when midinfrared lasers are used to drive high harmonic generation, the conditions for optimal bright, soft X-ray generation naturally coincide with the generation of isolated attosecond pulses. The temporal window over which phase matching occurs shrinks rapidly with increasing driving laser wavelength, to the extent that bright isolated attosecond pulses are the norm for 2-µm driving lasers. Harnessing this realization, we experimentally demonstrate the generation of isolated soft X-ray attosecond pulses at photon energies up to 180 eV for the first time, to our knowledge, with a transform limit of 35 attoseconds (as), and a predicted linear chirp of 300 as. Most surprisingly, advanced theory shows that in contrast with as pulse generation in the extreme UV, long-duration, 10-cycle, driving laser pulses are required to generate isolated soft X-ray bursts efficiently, to mitigate group velocity walk-off between the laser and the X-ray fields that otherwise limit the conversion efficiency. 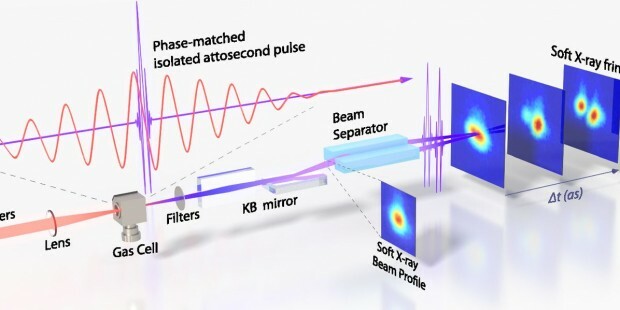 Our work demonstrates a clear and straightforward approach for robustly generating bright isolated attosecond pulses of electromagnetic radiation throughout the soft X-ray region of the spectrum. Attosecond pulses driven by femtosecond lasers make it possible to capture the fastest electron dynamics in molecules and materials. To date, attosecond pulses driven by widely available 800-nm lasers were limited to the extreme UV region of the spectrum, which restricted the range of materials, liquid, and molecular systems that could be explored because of the limited penetrating power. Our recent work showed that longer-wavelength midinfrared driving lasers at wavelengths from 1 to 4 µm are optimal for generating shorter-wavelength, bright, soft X-ray beams. Here we show that longer-pulse-duration midinfrared lasers are also optimal for generating shorter-pulse-duration, attosecond, soft X-rays. This is an unexpected and beautiful convergence of physics: bright, soft X-ray high harmonics naturally emerge as isolated attosecond bursts.